All advertising posters carry simple messages that can be assimulated very quickly. Railway Posters typically feature the four great railway companies of the early 20th century: the London Midlands and Scottish (LMS) railway, the London and North Eastern Raliway (LNER), Southern Railway (SR) and the Great Western Railway (GWR). A British Rail Poster - 'Prestatyn Holiday Camp For A Real Holiday' After J Henry (SC20/1207). 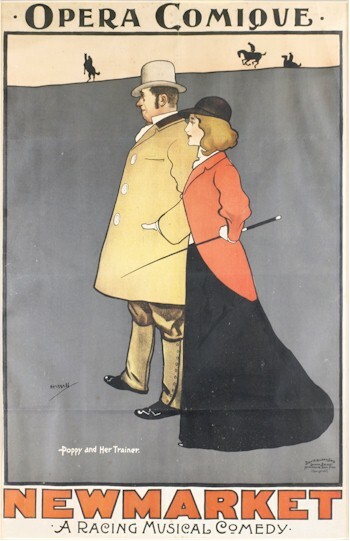 Railway poster artists include Norman Wilkinson, Frank Sherwin, Claude Buckle and Terrence Cuneo. Cinema Posters range from those of the silent movie era to more recent productions including James Bond 007 films, the Star Wars Trilogy, Batman and Apocalypse Now. The category also includes theatre posters. Travel Posters started to appear at the very birth of popular holidays offering 'exotic' places to go that few up until that point had travelled to, including Paris, London, Rome and Athens. Opera Comique - Newmarket: A Racing Musical Comedy. A coloured advertising poster produced by John Hassall (1868-1948) and published by David Allen & Sons (SC15/73). Besides capitals and other famous cities, such sights as the French Chateaux were popular topics. Early aircraft posters also neatly fit under this category. Shipping Line Posters were also very popular in 1930s and were produced by all the major shipping lines including P&O, Red Star, White Star.